Here’s a look around Northwoods Resort including images of our canoeing, summer potlucks and relaxing at the Resort. Canoeing on the Au Train River is a favorite of many who visit the Au Train area. This beautiful river is a beautiful paddle with nature in abundance. 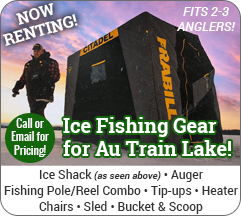 Northwoods Resort offers a relaxing atmosphere on beautiful Au Train Lake.